This week I visited Sloan’s Ice Cream at Downtown at the Gardens. 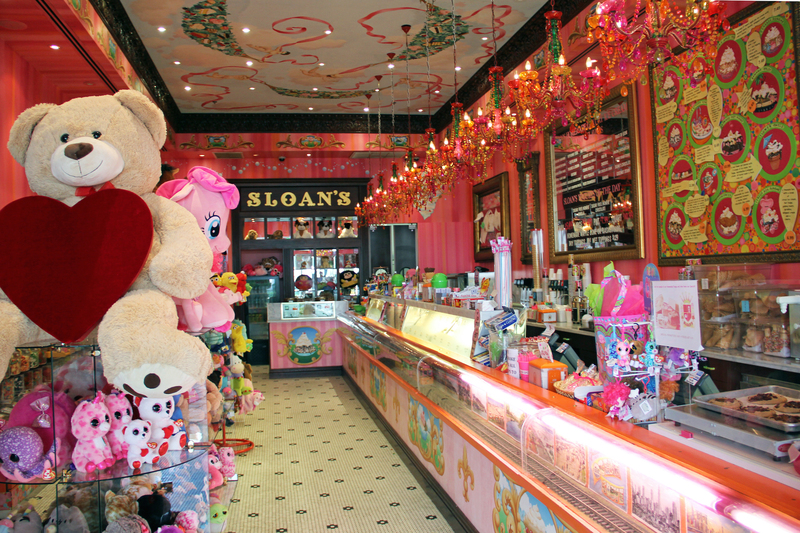 Located on the ground floor, just off the main courtyard, Sloan’s is the perfect spot to stop in or grab and go. The decor is lively and whimsical with pink walls, a ceiling of sugary cherubs, a miniature train moving its way up and down the lit counter and multicolored chandeliers hanging. They offer a wide variety of sweets and treats with a full counter of ice cream, fudge, truffles, chocolate-covered pretzels, cookies, macaroons and more. They also have an assortment of gifts, perfect for a little one or that someone special. I especially love their rose boxes that can be filled with chocolates, not to mention one of the largest heart boxes I’ve ever seen (pictured below with an equally jumbo-sized teddy bear). I started off trying their Chocolate Covered Strawberries, which are a hot item with Valentine’s Day almost upon us. They have a great selection with milk, dark and white chocolate available with toppings ranging from coconut to sprinkles to nuts to chocolate drizzle and the ever-popular tuxedo. From there I made my way to the ice cream counter where the Brownie Hot Fudge caught my eye. 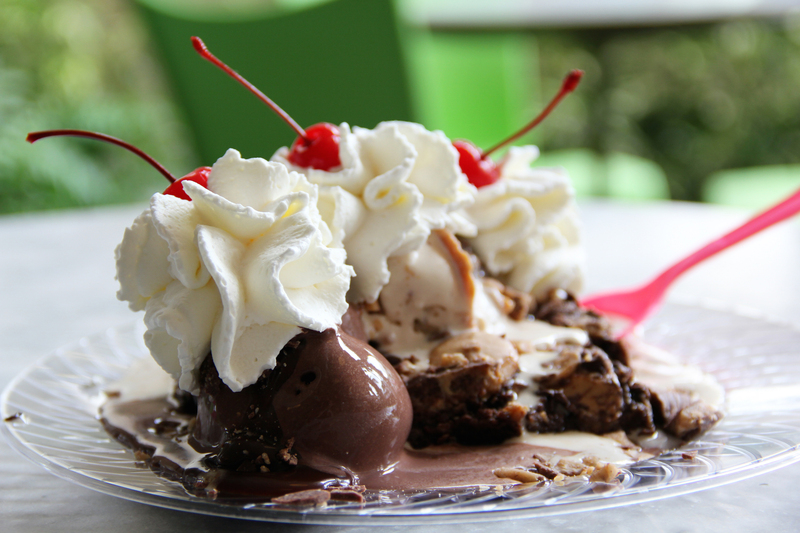 Now THIS is a sundae. A “Kitchen Sink Brownie” stacked with three scoops of ice cream drizzled with peanut butter, caramel, toffee and butter crunch topped with three mounds of whipped cream with a cherry at each peak, this was a sight to behold. It was decadent with the perfect blend of textures and the quality ingredients shining through with each bite. While the sundae was a gorgeous display, the counter also hosted an array of flavors perfect by the scoop. A couple of the flavors that stood out had Sloan’s housemade cakes mixed in creating delicious treats like Birthday Cake and Carrot Cake. They also had Krispy Kreme doughnuts worked in to create Coffee & Doughnut ice cream and an amazing Apple Pie. I was thrilled to hear that they buy an absurd amount of Girl Scout Cookies to create a limited-time Scout’s Honor ice cream. 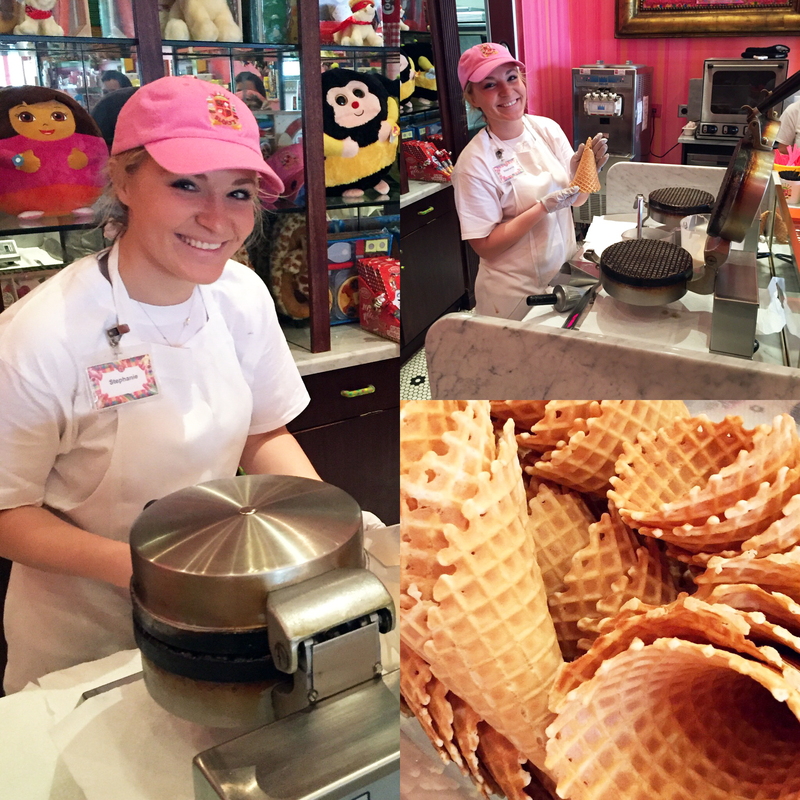 And if you’re curious about the freshness of the waffle cones, not to worry! You can watch them press and roll each cone at the back counter. They also dip cones in chocolate and toppings if you are in the mood for a fancier cone experience. So whether you are looking for a pre or post movie treat, wanting to impress a date, have a sweet tooth after dinner, are in the market for a gift, or just need a chocolate-covered Oreo on a Monday, pop in to Sloan’s Ice Cream and enjoy some their high-quality, housemade, Belgian chocolate drizzled, aromatic, fresh and delicious offerings.